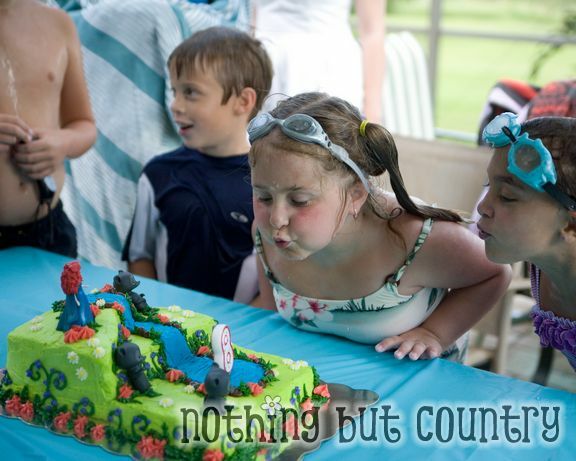 My little girl turned 8. That’s a big thing in our household Being 8 is Great!! I searched the internet high and low. VERY LITTLE was out there for a Brave party. So I had to use the little bit of inspiration on Pinterest and spin off on my own things. I wanted to reuse as much as possible. I litterally threw this party together in under 2 weeks. So I thought I would share our party with our wonderful readers in case you too need to have a Brave party. (Photo above- our own Princess Merida aka Birthday Girl) Dress came from Etsy– best seller ever - She got us this dress in record time for her birthday Thank you Tootietots!! I also had fun straws. I got them at like 70% off at JoAnn’s a while ago. I picked up a few packs. Their clearance along with a 15% off EVERYTHING coupon = CHEAP STRAWS!! WOOHOO!! 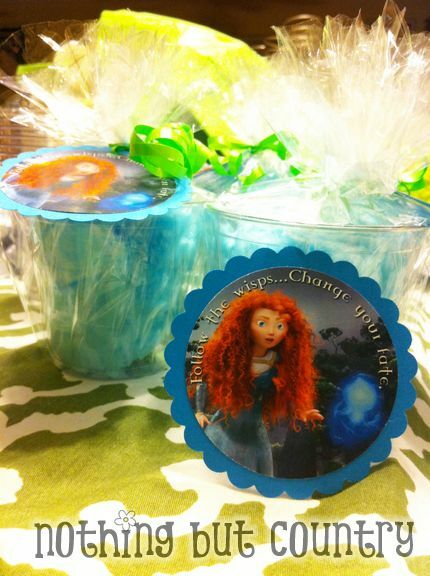 In the movie – Merida follows blue Wisps. 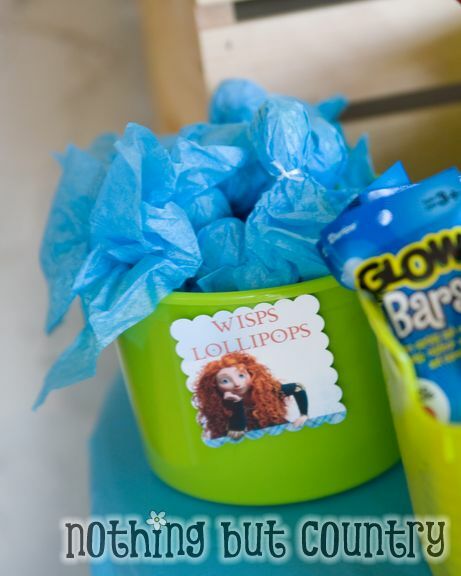 So we used tootie roll lollipops just like you make halloween ghosts, we did blue tissue paper to make Wisps. Here is another photo (sorry from my iphone) Of the wisps up close. Here is a better photo of the Hershey bars This turned out so cute!! 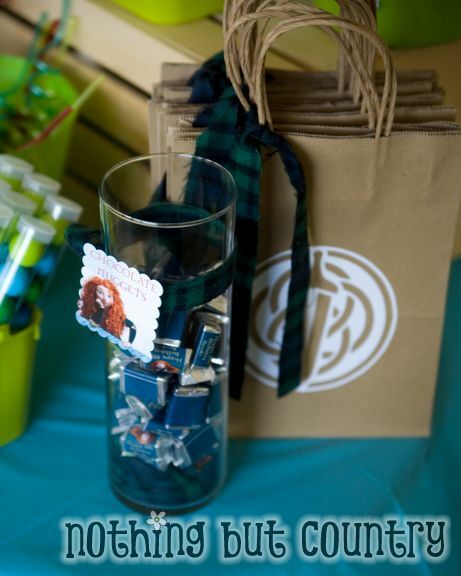 The goodie bags- I used kraft bags from the Dollar Tree. 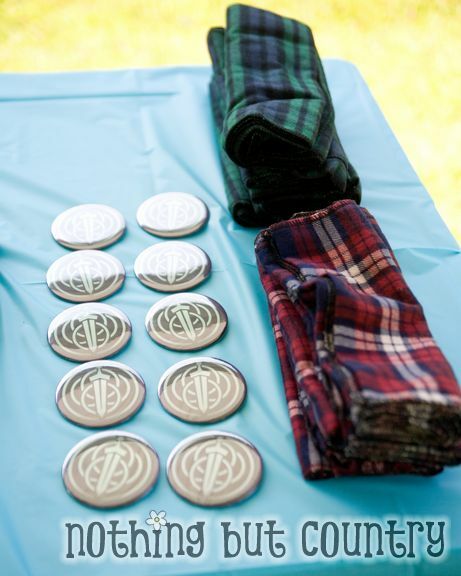 Tied on plaid fabric and on my Silhouette machine- I did a trace using the Dun Broach Clan (that was Merida’s clan she belonged to) Had my Silhouette cut out the symbol and glued them to the front of the bags I love how those turned out too!! Back of the bag tag. 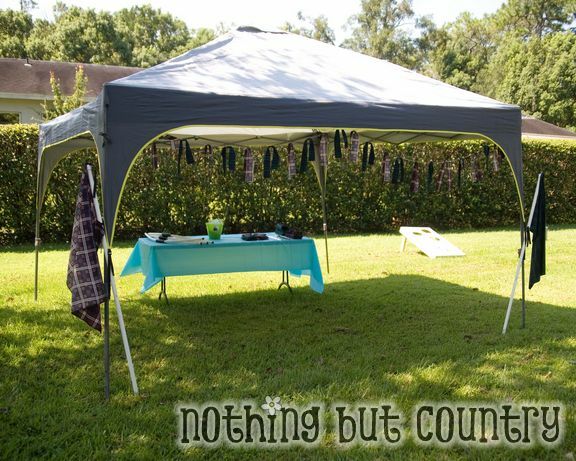 Outside we set up our beach tent. 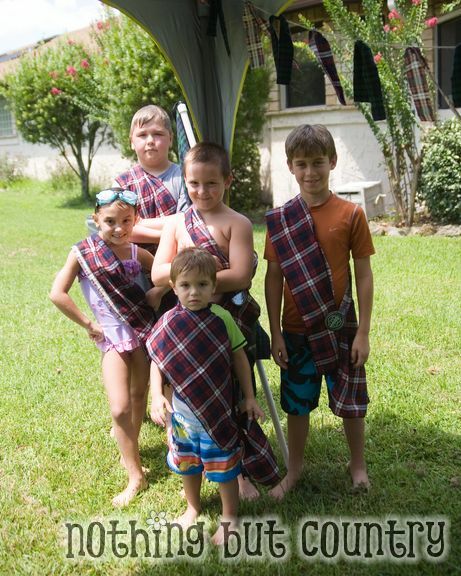 To host our Scottish Highland Games All the kids went outside to do 3 games and 1 craft. 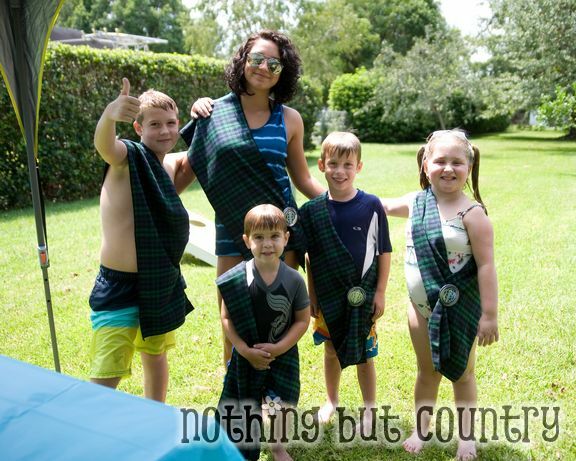 Scottish families are represented by their Plaid sashes or kilts. I already owned a bunch of red plaid. 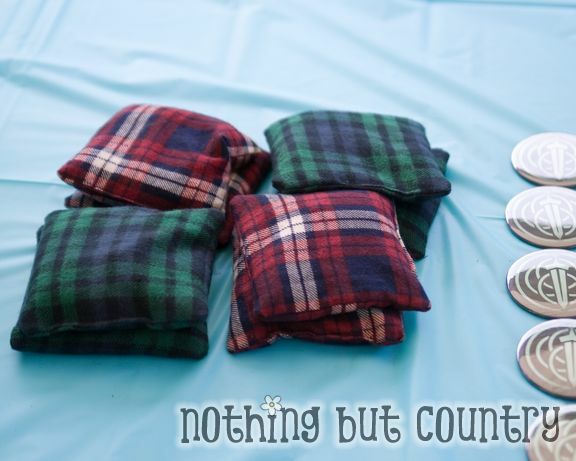 I used a 60% coupon from JoAnn’s Fabrics and purchased Green/Blue plaid (similar to the movie) And used the fabric alot in this party. 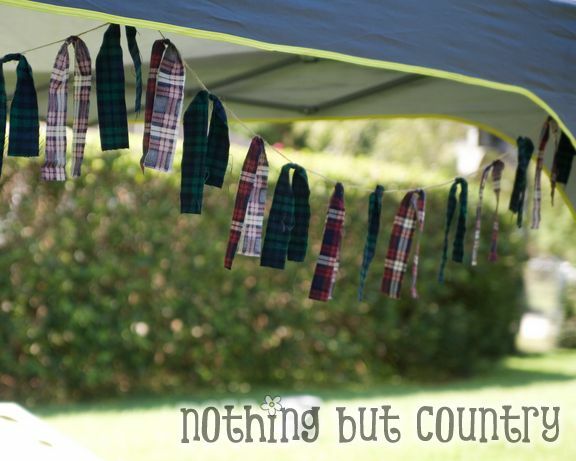 I tied 2 inch x 20 inch strips onto twine just for a swag/garland decoration to the tent. Very easy to do. Every 6 inches i tied on a colored fabric strip. We created flags. One of each fabric. Simply serging the outside edge and tying it onto a 5 foot PVC pipe. I added a cap to the top of the PVC pipe and used a screw in round eyelet , screwed in so I could tie the flag on so it wouldn’t slip. I did a red and a green plaid flag for decorations. We had 10 kids participating, we made sashes for each of the kids. They measured 11 x 60 inches. Simply cut out and serged the outside edges that was all. For the buckle we just made Dun Broach Clan symbols in our button/pin maker. So they could pin the sashes on and we could form 2 teams. AKA Clans. 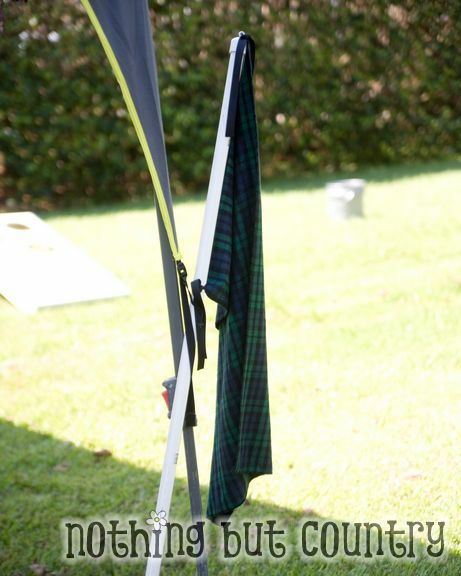 It was a pool party- and this is our Green Clan (sashes on and the pin to hold it together like Scottsman wear. 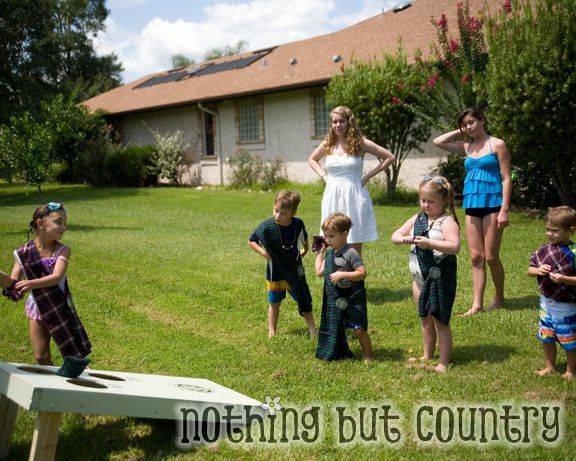 Then the Scottish Highland Games began!! Our 3rd Activity was a HIT!!! 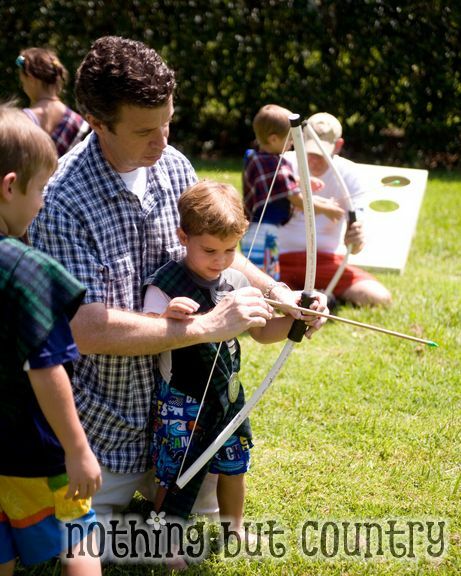 Merida loved to do archery. So we played an archery game that was EXTREMELY popular. Everyone loved it, even the dads and older siblings. The instructions for the bows came from the blog – Skip to my lou. 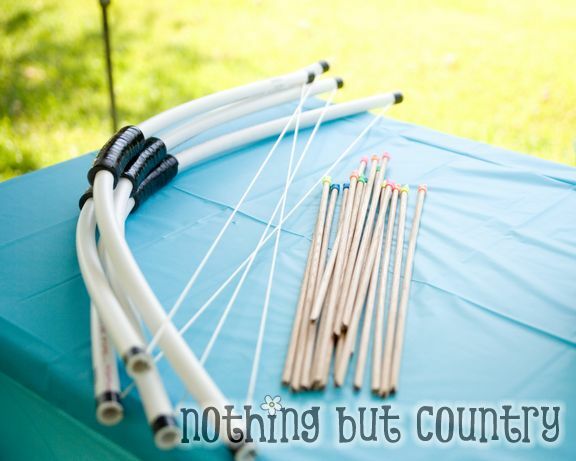 PVC Bows. We did make a few alterations. 2- I didnt like their arrows very much. The arrows are 16 inches and 3/8 of an inch wooden dowels. We simply E-6000 pencil eraser caps to the end for our arrows and used our saw to cut a notch on the back in to help shoot them. They worked great!! Basically the team with the most members to shoot the furthest won a point. After everyone shot 4 arrows the team with the furthest shot won a point till everyone had a turn. Then the team with the most points won. Follow? Clear as mud? 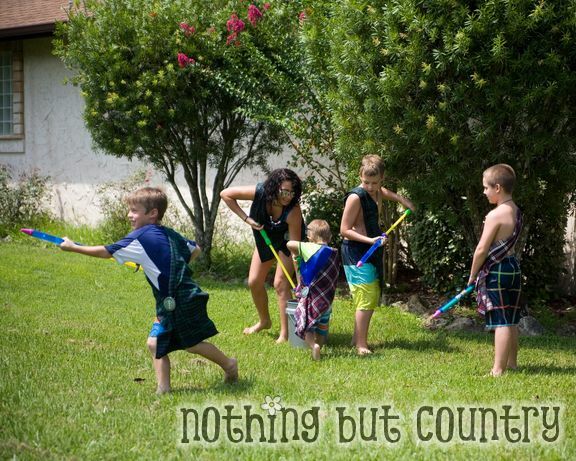 Last but not least we saved this for last- was our water shooting contest. Go to war (water war) and out soak the other team. Sashes were fabric (could get wet) Pins were relatively water proof. I was SOOO EXCITED how this BRAVE cake turned out. It is filled with raspberry filling YUM YUM. I got the little figurines from Toys R Us. And created the cake. This was our 1st big cake decorated. I am pleased how it turned out. 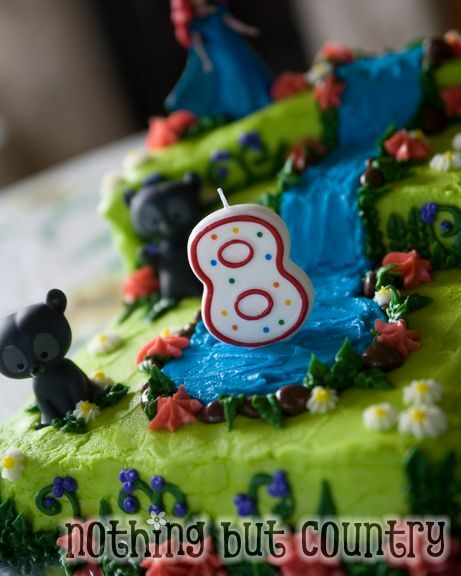 I have to thank PINTEREST for finding this fun cake – Cakes & Cookies Blog. I love the cake they made I had to try it too. Not too shabby for my 1st try. We did a bbq for the party. Hamburgers and Hotdogs and lots of sides. 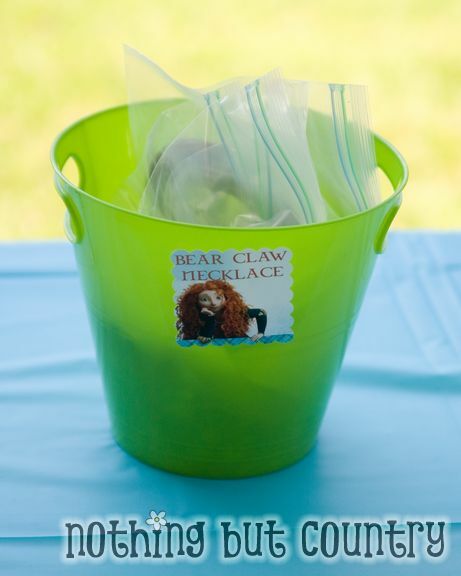 There was ONE OTHER goodie bag item I made that did NOT survive the Florida heat. I was SO SO SAD. I would definitely make them again but not use them in a hot environment. 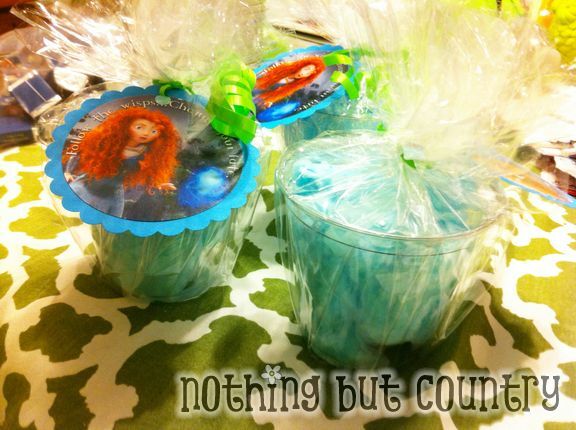 Clear plastic cups filled with blue cotton candy. Wrapped in cellophane and a tag I created. I was so sad the heat KILLED IT. It melted it and turned rock hard. The humidity and heat was not good to the cotton candy. So– I was bummed!! Better luck next time right?? Also– the chocolate– since it was an outside party on the porch. I had to keep the chocolate items in a fridge and brought out till JUST before the end of the party. For obvious reasons. Florida heat can put a damper on fun yummies for sure. I have to thank my wonderful husband for helping out so much. He actually did MOST of the sewing!! HE ROCKS!!! HAPPY BIRTHDAY TO MY BIG BRAVE GIRL!!! 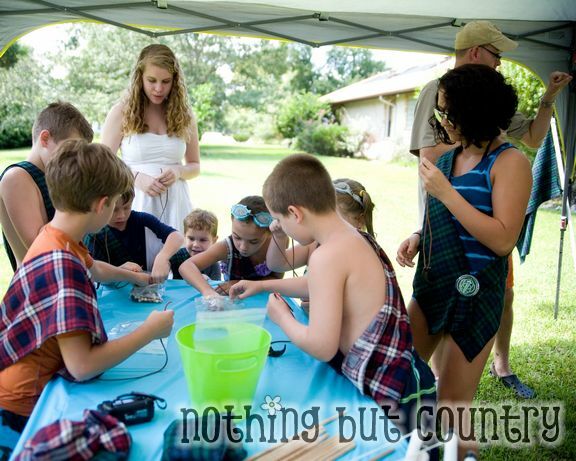 This party looks amazing.. I’m sure Brooke love it! 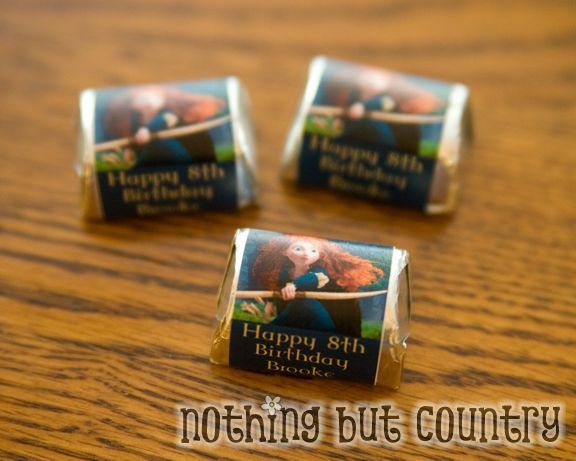 How do you make your chocolate bar labels and where did you find the art work for all of your tags/labels? Everything was just so cute! What did you use to attach the eraser to the arrow? I made all my labels in photoshop. And the art work I found in google images Thanks so much!! I used E-6000 glue. It is the most awesome glue ever. The link for how to make the bows isn’t working! I really would like to make some. Can you post how? Was wondering if you used a template for your candy wrappers in Photoshop. If so, where can I get them and what version of Photoshop are you using? My 8 DD is having a Brave party and I have been trying to plan something nice. Oh thank you, thank you, thank you for sharing all of your wonderful ideas!! You are right, there are hardly anything out there for Brave parties right now, but bet your brilliant party will be the one everyone copies! wow, I am so impressed by all your ideas. Extremely creative – esp that you only had 2 weeks to get all of this done. 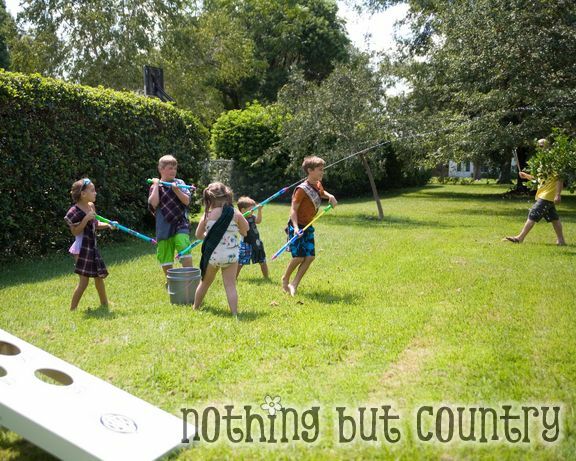 I’d love to borrow some of your ideas for my child’s party in a month. Thank you!! 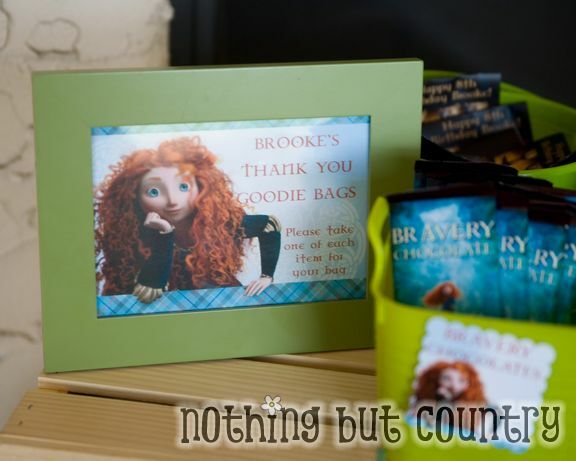 My daughter loved Brave. These are some really creative ideas! And your cake looked great! thank you for these ideas, these are awesome we r planning a brave party in november and needed some fresh ideas. I love this!! Amazing party. I was wondering if you’d share the silhouette file. I’d love to use it for our upcoming party. Of course I’d credit you in my inevitable blog post. 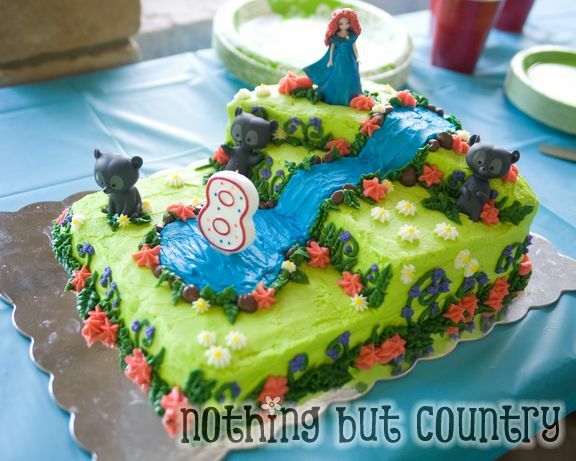 I’m a pinterest fan, and I was searching for brave party ideas for my little girl’s next bday party, she also is turning 8 this November 2012. I really liked your ideas for the party, I was woundering if you can tell me where can i get the printables for the chocolates and cookies, invitations. Thanks and hope you can write me back. I was researching Brave party ideas and found your site! So creative!! I absolutely LOVE the wisp lollipops – I am going to borrow this idea, but of course I will link to you when I blog about it So awesome! And to think you only had TWO weeks!! You did an amazing job! Of course my 3 yr old wants Merida because her older sister loves it! 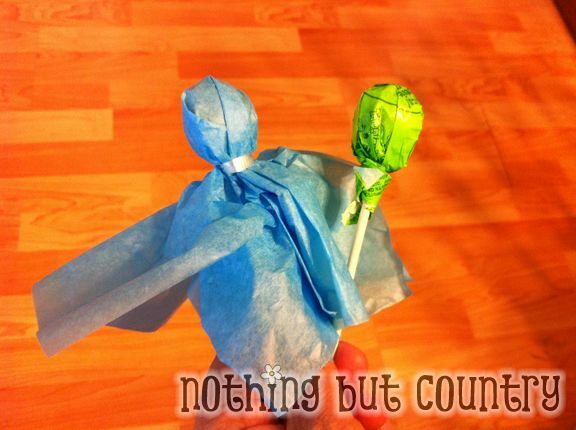 I would love to know how u did the candy wrappers. Are they off a site or do I have to make a template??! I’m not the most experienced computer person so any help would be appreciated. Thanks so much! I don’t know about the last person that commented but I’d be willing to purchase some of your jpg artwork, maybe she would be interested in purchasing too! 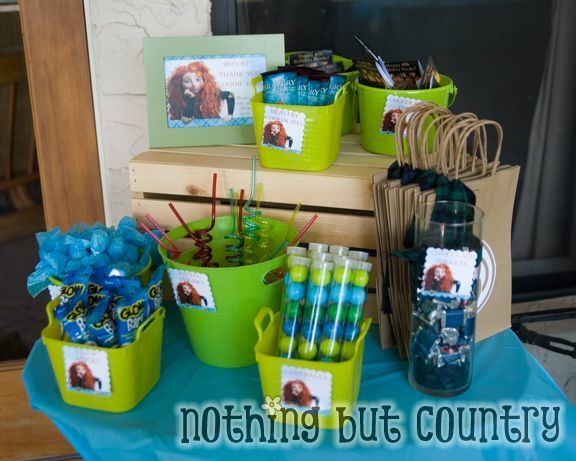 I love your ideas for the Brave theme birthday party. I would like to know where I could get those lime green plastic pins that you have the favors in. I can’t seem to find them anywhere. oops…I mean lime green plastic bins/buckets – not pins. My daughter already told me she wants a Merida party this summer. Thanks for doing all the planning! You ideas are perfect so now I don’t need to reinvent the wheel! Thank you so much! You’ve saved me SOOOO much time. I love ALL of it!!! I would love to know where you got the labels for the water bottles, chocolate and the symbol. 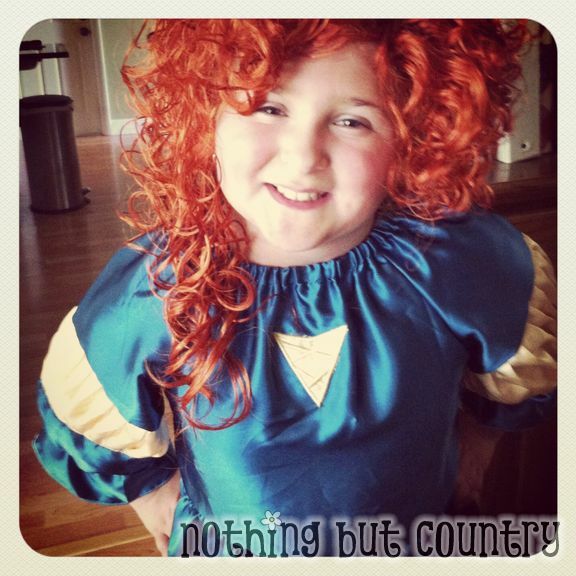 Your ideas are amazing and my daughter wants a Merida party this year, so I was hoping to borrow some ideas from you. Thanks so much!!! I’m so happy to have found this! Thanks for all the great ideas! I agree, you have great ideas. 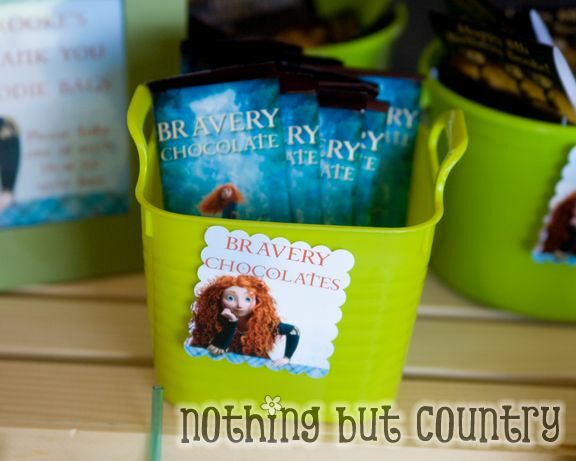 My niece wants a Brave party too and all I’ve found so far are the typical princess favors. 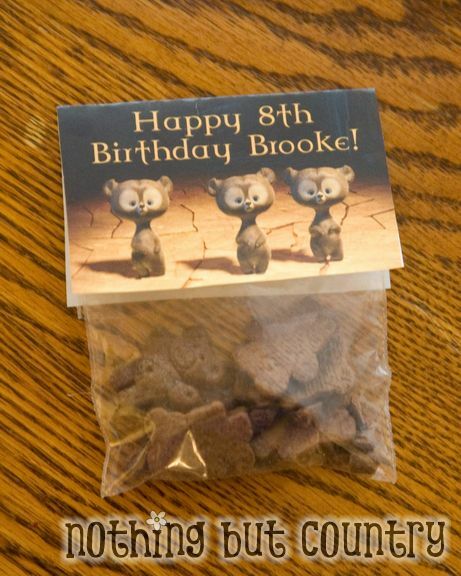 I especially like the bags with the bear cookies. Can you let me know how you did the labels for those and the water bottles? and the small chocolates? I love your ideas! They are great and your daughters party looked amazing. I wish my daughters birthday was in the summer. Do you share your labels? How do you find printable versions ? This is awesome. I was looking for some ideas and come across your link. Fabulous!!! 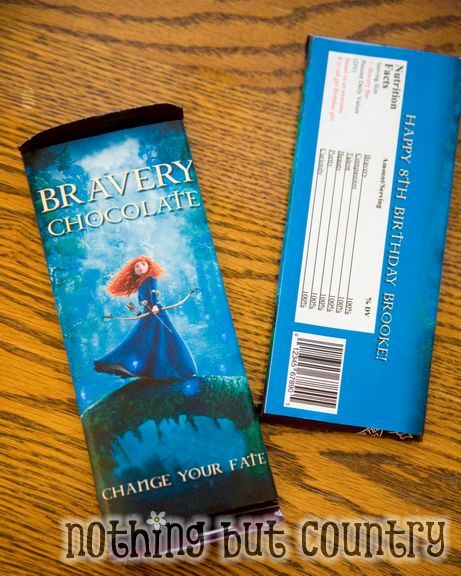 my daughter is turning 9 and want Brave theme party. This is exactly what I was looking for. Thank you so much for sharing your party ideas. I love these Brave designs. 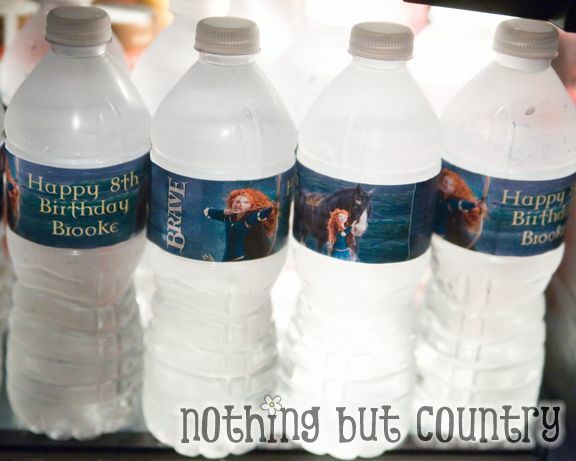 My daughter would like a Brave theme for her 5th birthday party. I wish I were as creative as you! 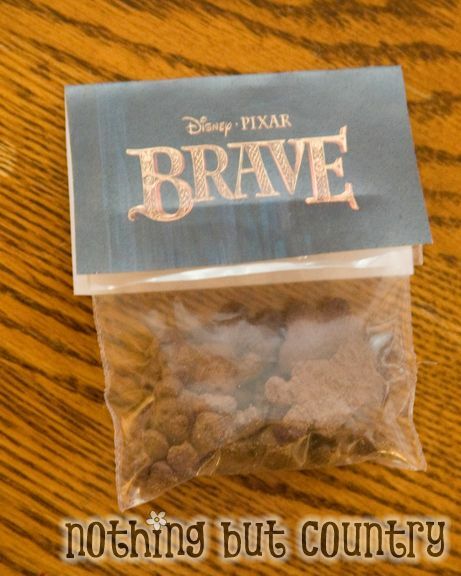 We are doing a brave theme for our young women’s camp this year. 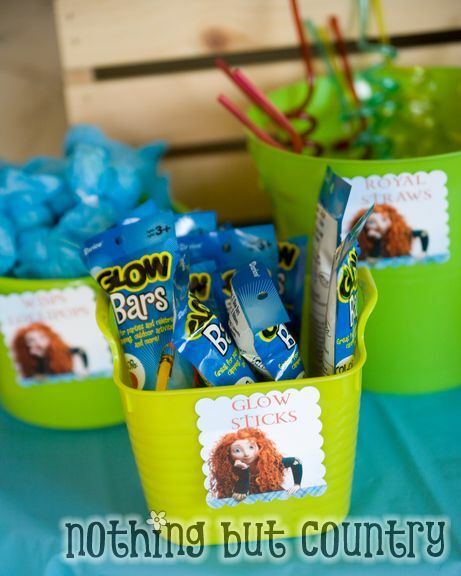 I would love it if you could share e candy bar printable. Thanks! I came across Skip to My Lou’s bow and arrow set first, but glad I found yours because I like the eraser tips better than the foam tips. I can’t, however, fit the erasers onto the 3/8″ dowel rods. I’ve pushed and pulled and squeezed….no luck. Any tips? Thought about purchasing the next size smaller (dowel rods), but concerned that the erasers will then be too big. Hi I am having my daughters Brave party this weekend and I love all of your ideas. I am using the cotton candy wisps. I am not creative and don’t know how to make those tags. Could I buy the printable image from you? Or do you know where I could find one? Looks like an awesome party! 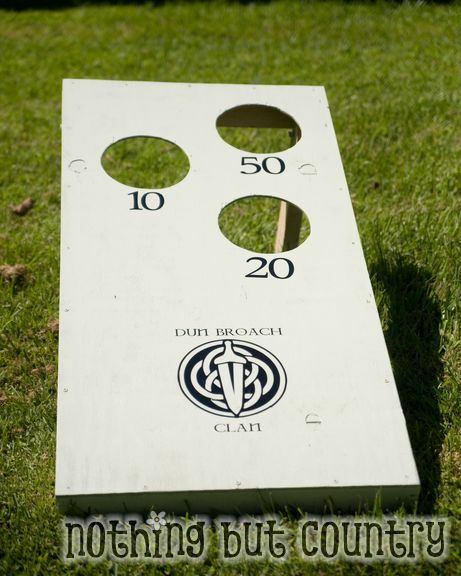 Where did you find your Dun Broach Clan symbols? I can’t find clip art for these anywhere. My soon to be five year old first requested a Rapunzel party. Pinterest is crawling with ideas for Rapunzel. But, to my dismay, she now has her heart set on a Brave party. Your collection of ideas is by far the best I’ve seen! You planned an awesome party! Thanks for sharing. Hi! 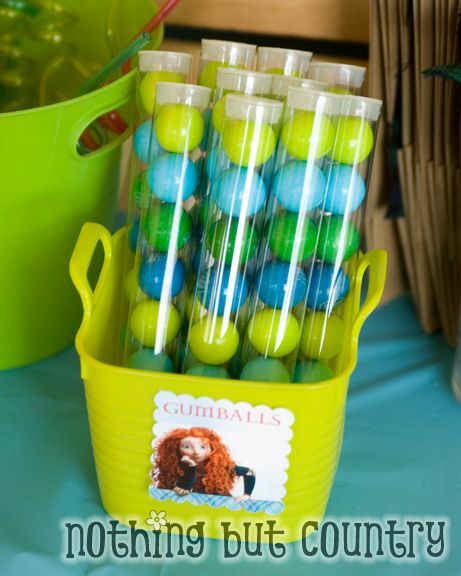 Where did you get your gum balls and gum ball containers? Can I buy the printables from you? How do I put the words on that pic of her and the wisps? This is the far THE BEST Brave party. I love it. Can I purchase the printable also? My 4 year old birthday is coming fast and I really LOVE your designs. You are so creative! I love the idea! I would like to purchase the printables. Please email me the details. Thank you!! Love this idea!!! My girls are so into Merida. 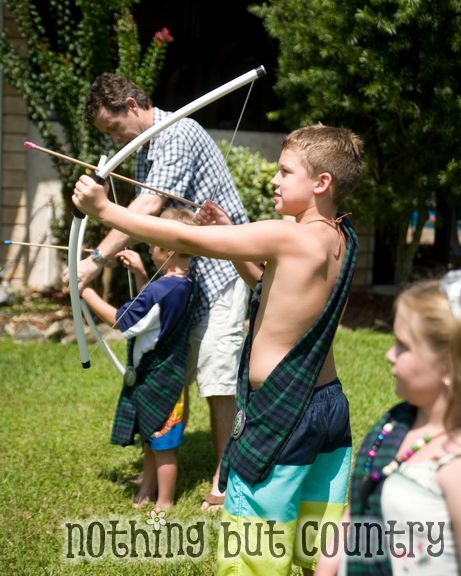 I especially love the bow and arrow- I sooo need to make some. Thank you for the post! My soon to be six year old has been talking about having a brave birthday party since November (her birthday is in August!). While I had a few ideas – like a wisp trail leading to a cauldron, your post has pulled the rest of it together for me. Thank you for sharing the details of your fabulous party. Please message me with details on how to obtain your printable files. Thanks! 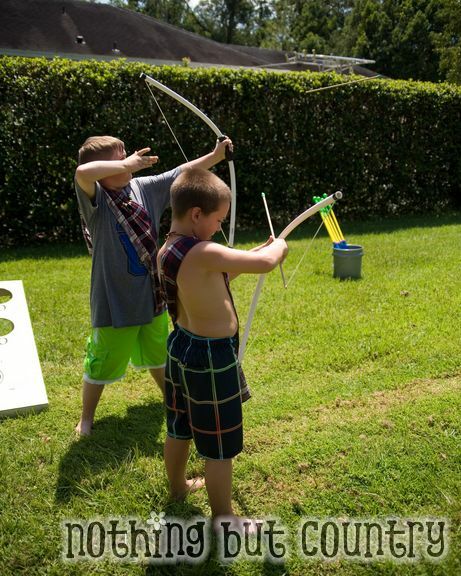 Thank you for your comments on how you modified Skip to My Lou’s bow & arrow project. We followed the directions with your modifications and they were perfect! I guess the only modification we made then were making the strings longer. 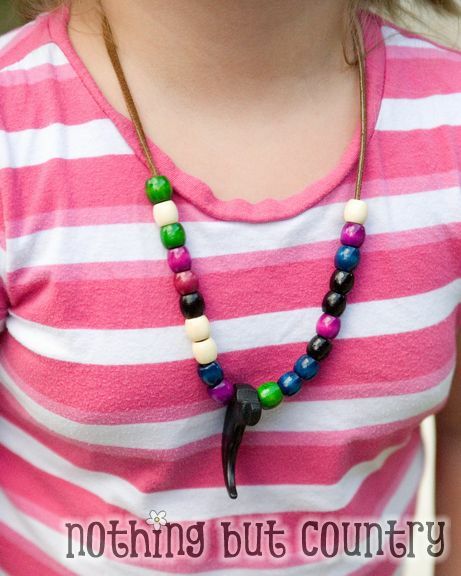 Made it less sore for the little ones when the string accidentally hit their thumbs or hands. We cut them about 41 inches long then knotted it about 38/39 inches. It was tight enough to still work. I would also like details on how to obtain your printable files. I would be happy to pay for your time that you spent making these wonderful printables!! !